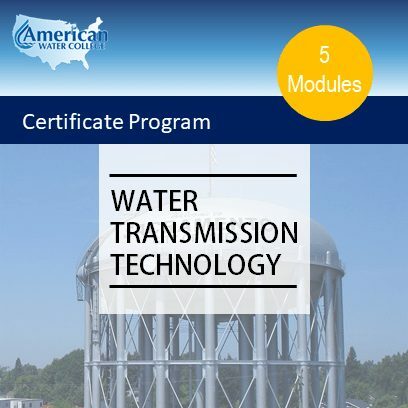 Earn your certificate in Water Transmission Technology through American Water College. This program is a one year online certificate program. Students complete the program by watching online lectures, reading assigned texts, and submitting assignments online. –The high school student interested in beginning a career in the water industry. –The adult learner looking to enter the water industry as a career change. –The industry professional ready to advance their career with a certificate in water treatment technology. Supplemental materials for students who want to go deeper into the subject matter, or need additional information. The online format allows you to schedule your studies around other commitments. Prepare you for a career as a water industry professional. Give you the knowledge required to pass state certification exams, and more importantly to provide the public with a reliable and safe water supply. Allow you to skip the entry level certification exam and become certified at a higher level. Distinguish you from other job applicants by showing a commitment to learning about the water treatment process. Because affordability is important to us, tuition is only $1,299. You will also need required text books (listed here) to complete the program.